In a pan, add green peas, sliced onion and 1 cup of water and cook for 5-7 minutes. For retaining its green colour, avoid overcooking. When cooled, grind it to make a paste or puree and keep aside. Heat butter in a pan, add plain flour and saute it. Reduce the heat and add 1 cup water, mix well. Add green peas puree, pepper powder and salt and mix well. Add warm milk and bring to boil. Garnish with fresh cream and serve hot.. Delicious soup! Love the swirl of cream on that beautiful green. Delicious and healthy soup..beautifully presented! Wonderful bowl of delicious soup. This soup looks very temtping. Shabs I have never tried pea soup but looking at your pics make me drool. very different and delicious soap..
Soup looks mild and delicious!!! this looks so creamy and delciious. 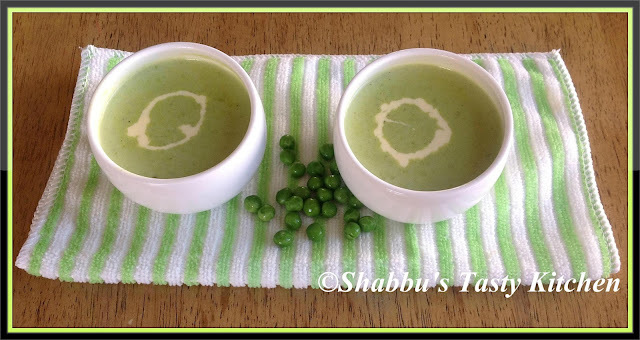 Green peas soup looks delicious. very innovative,haven't tastes peas soup...sounds delicious n healthy...bookmarked!! Nice green and healthy soup!